The Secretary General will appear at UN Headquarters on September the 17th to launch Energy and Global Climate Change by Dr. Anilla Cherian. United Nations Secretary General Ban-Ki Moon will announce the publication of what could become a key book on global climate change this month. Energy and Global Climate Change: Bridging the Sustainable Development Divide, is the result of a deep analysis of decades of UN agreements on sustainable development and climate change, and finds these agreements wanting. Dr. Anilla Cherian, an independent global energy expert and the author of Energy and Global Climate Change, argues that a lack of integration between negotiations on mitigating climate change and energy access for poorer countries has held up development in both these areas. She claims that this, which she calls the “siloization”, has hindered both solutions to the problems of polluting energy sources and the development of more sustainable energy services in the developing world and beyond. The Secretary General will appear at the delegates’ lounge of UN Headquarters in New York on Thursday, September the 17th, at 6pm local time, to launch the publication, just a week before a major UN summit on post-2015 development plans expected to attract heads of state from around the world. 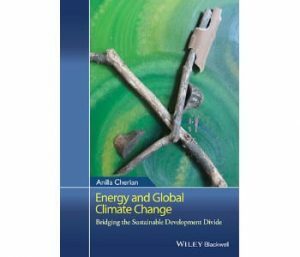 Energy and Global Climate Change: Bridging the Sustainable Development Divide is published by Wiley, and will be available to purchase after the launch event; click here for more information.